UAE Team Emirates’ Alexander Kristoff, who made his team debut, finished a respectable fourth place in what was a thrilling sprint finish during stage one of the Dubai Tour (photo Bettini). The reigning European Champion battled it out with riders in the final kilometre and crossed the finish line at the world-famous Atlantis, The Palm in front of a cheering crowd. The team, wearing the colours of the UAE, put in a strong performance throughout the race, establishing themselves as part of the main peloton who controlled the breakaway riders throughout the 167km route. As they made their way on to The Palm Jumeirah for the final 15kms, they found themselves bunched behind the race leader in a promising position. However, just 8km from the finish, UAE Team Emirates’ Yousif Mirza was caught up in a crash that saw a number of the peloton brought down. The Emirati rider picked himself up and without serious injury finished the race. Norwegian Kristoff proved why he is considered one of the best sprinters in the world by driving forward in the final meters of the race and narrowly missing out on a podium position. The opening stage of the tour was won by Dylan Groenewegen (LottoNL-Jumbo), who claimed the blue jersey – the jersey reserved for the leader of the GC standings – which he will wear during tomorrow’s stage two from SkyDive Dubai – Ras Al Khaimah. 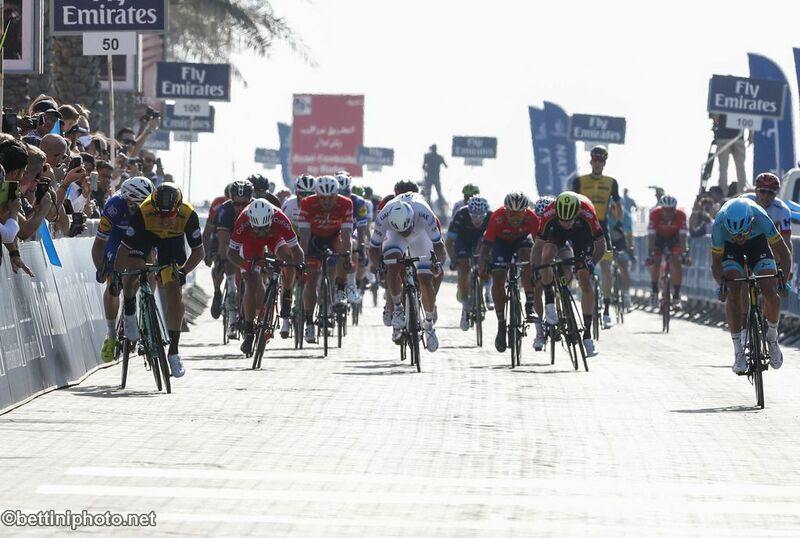 Reflecting on the opening stage of the Dubai Tour, UAE National Champion Yousif Mirza commented; “It’s a pity that the Dubai Tour began with a little bit of bad luck for me. I was trying to give my support to the team in order to help Kristoff approach the sprint in the best possible position, but the riders in front of me crashed and I could not avoid them. Luckily there were no serious injuries and we can look ahead to tomorrow’s stage, where we hope to have more of the amazing support that we witnessed today.”. Riders will face another sprint test in tomorrow’s stage, as they depart from SkyDive Dubai, heading along the 190km route to the emirate of Ras Al Khaimah. The peloton will pass through Sharjah, Ajman and Umm Al Quwain before crossing the finish line at Al Quawasim Corniche, in what is expected to be another breath-taking sprint finish. 3 Elia Viviani (Quick-Step Floors) s.t. 3 Elia Viviani (Quick-Step Floors) 6″.